I've had this recipe from my mom for many years. For some reason it's something I very rarely make. But judging from the few crumbs that were the only thing to survive through Shabbat, I have a feeling it's going to become a regular here. When the cake was baked and cooled, the sugar and chocolate on top, together with the golden, crunchy cake was just wonderful. Mix together the batter ingredients. In a separate bowl, mix topping ingredients. Pour 1/2 of the batter into a greased 8x8 pan. Top with 3/4 of the chocolate chip crumble. 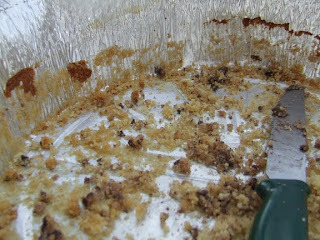 Cover with the rest of the batter and finally, the rest of the chocolate chip crumble. Bake 350 degrees F for 45 minutes.